Fashion trends seem to fluctuate oh so often in today’s world and owning an updated wardrobe becomes a necessity arising out of an innate desire in every women to look smoking hot and feminine. One versatile garment, which can amp up your style quotient and make you look nothing short of a fashionista with very less effort is the gold old Dress. Dresses are versatile one-piece clothing garments, which are comfortable and stylish at the same time. This chic garment comes in infinite variants of detailing, cuts, transparency, dress shape, pattern, dress length as well as prints to suit all occasions and seasons. So we have dresses with floral/animal prints, embellished dresses, from mini to maxi length dresses, from skater to bodycon to peplum dresses, from laces to velvet dress fabrics, as well as casual, ethnic, formal or party wear dresses. To top it all, it’s time to bid farewell to the year that has been and if you are still deciding on what to wear for that party with friends or family or colleagues, then read on! A dress with thigh high slits is the hot favorite internationally after being adorned by the gorgeous ladies of Hollywood, such as Kim Kadarshin, Venesa Hudgens, and Jennifer Lopez. Near home, Deepika Padukone and Priyanka Chopra have also patronized this hot trend. And what better way to nail this look than with a red hot slit dress. 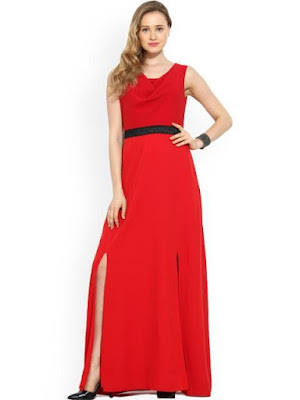 Pair this dress with sleek pumps and sparkling jewelry to be rechristened as the DIVA! One can never go wrong with a stunning metallic toned self-design dress with sequined details. Amp up your glam quotient this holiday/party seasonby pairing this dress with some elegant jewelry and pumps to become the talk of the town. Add an indo-western flavor to your dress collection with this gorgeous turquoise blue layered maxi dress with round neck and embroidered bodice. Team up this gorgeous dress it up with matching earrings and stilettos to add a gorgeous spin to your look. An LBD (Little Black Dress) is the staple of every women’s wardrobe and what more can one ask for if it is peplum, sheer, embellished with ruffle details. The uniqueness of this dress will make you a showstopper at any party or function you attend. Style it with a pair of heels and a leather bag for a stunning look. So to look smoking hot this party season, make sure you have the right party wear. You can now make your life easier in this age of demonetization by online shopping where you can place your order and pay via various cashless portals. So ring in the New Year in style with the chic and elegant party wear.